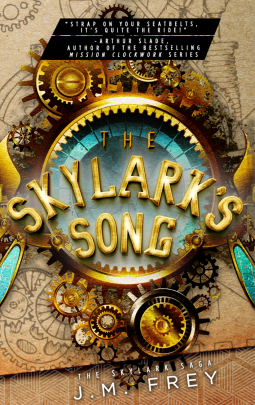 Overall, The Skylark's Song was a fun read. I loved the steampunk elements and the idea of the glider fights. Robin was an interesting character, and I enjoyed the fact that she wasn't perfect. She had her faults, so I could relate to her. There were some issues. The religion/race aspects were portrayed as important yet were never fully developed. Also, while I liked the Coyote as a character, the way he constantly said "my dear" was a little grating; it kept making me think of moustache-twirling villains. But, as I said, overall this was an entertaining and action-packed tale, and I would like to read the second book later, to see how it all ends. I would give this book 3.5 stars, but a 3.5 that rounds up to a 4, rather than down to a 3.